On Friday afternoon, having netted the praise of Broad City's stars on the day she announced she'd be running for president, Hillary Clinton visited the Broad City set, according to a photo she posted to her Twitter page. In the photograph, Clinton stands with Abbi Jacobson and Ilana Glazer, the creators and writers of the show. That's not all: The three were also joined by Amy Poehler. Oh, and Clinton's response is "#Yas." Seriously. "On the set of @broadcity season 3 with @abbijacobson, @ilazer and Amy! #yas," Clinton wrote. Meanwhile, the show posted on its official Twitter account: "Just three best friends on the set of @BroadCity season 3! #Hillary2016," alongside a photo of what appears to be footage of Clinton with Jacobson and Glazer on camera. In another tweet, it wrote: "Crying red white & blue tears.Hanging w/kween @HillaryClinton on the set of season 3! #Hillary2016 #AmyPoehlerSelfie." 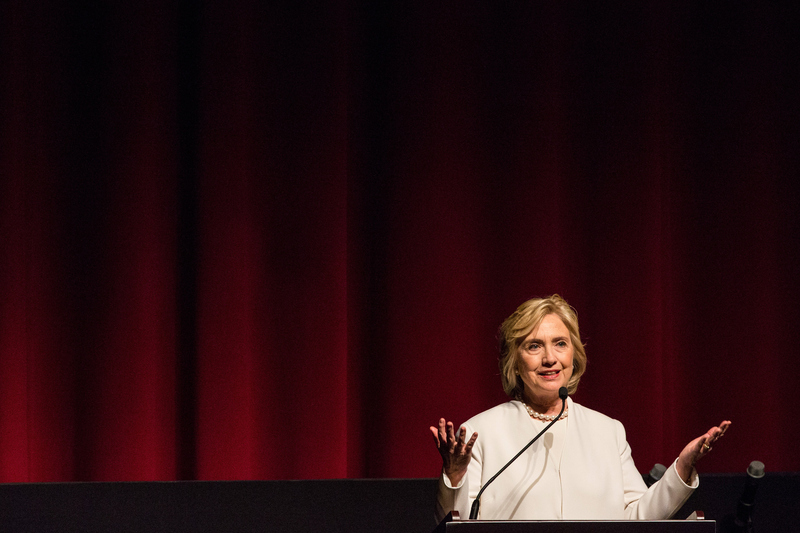 Which begs the question: Will Clinton appear on Broad City? It wouldn't be completely out of the blue: Glazer and Jacobson have expressed their support of Clinton via Instagram, and Clinton appeared on Saturday Night Live earlier this fall as straight-talking bartender Val. Additionally, Poehler appearing on the set alongside Clinton and the show's stars implies that they're filming a special event of some sort, and Clinton told CNN at the beginning of her campaign that “Amy is a friend of [hers]." Plus, it's no secret that Clinton is targeting the young millennial crowd, a significant portion of which seems poised to support her Democratic primary competitor, Bernie Sanders. Meanwhile, Broad City has been met with almost universal acclaim, sizable viewing figures, and with its third season premiering in February, could feasibly be looking to capture some additional buzz for the show. And here's Jacobson back in April. It's pretty much a match made in heaven.